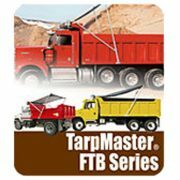 TarpMaster® FTB Series tarp systems include selected pre-assembled tarp system components designed to fit most industry standard dump trucks based on tarp length. TarpMaster® systems fit dump trucks using up to 24 feet of tarp. 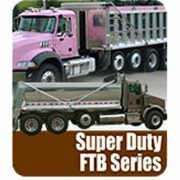 Super Duty FTB Series tarp systems include selected pre-assembled tarp system components designed to fit most industry standard dump trucks based on tarp length. Super Duty systems fit dump trucks using up to 24 feet of tarp. 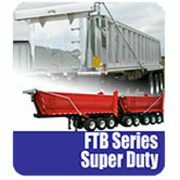 Super Duty FTB Series tarp systems are available for longer dump trailers. Tarp trailers up to 44 feet with our standard tarp housing. High Capacity option is available for trailers up to 53 feet. 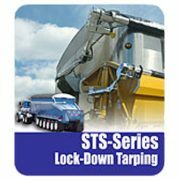 STS Series “lock-down” roll tarp systems are designed as an alternative to hydraulic flip style, cable style or manual crank lock-down roll tarp trailer covers. “Lock-down” accessories are standard on sealed variations and optional for mesh applications. 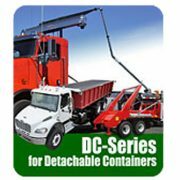 DC Series tarp systems featuring our patented sliding pivot accommodates even older style roll off and hook lift trucks. Install our sliding pivot on your roll off or hook lift at 108″ outside width and still clear a 102″ wide can with room to spare.